Yoon took first place in the 100-yard breaststroke at Meet of Champions and helped Cherry Hill East to second place finishes in two relay events. 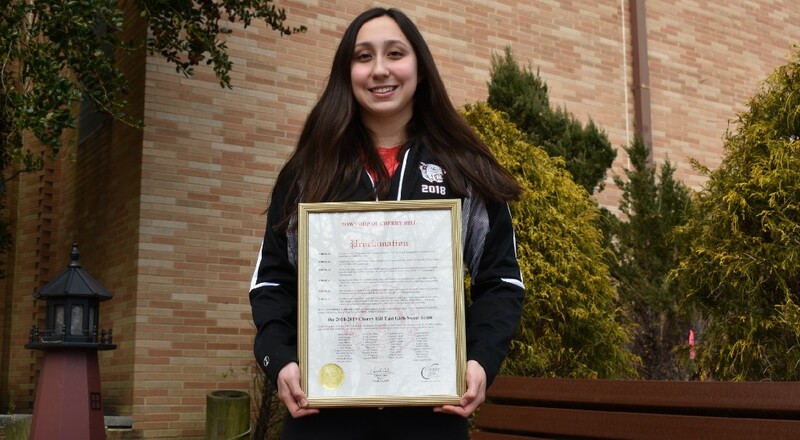 Grace Yoon holds the proclamation Cherry Hill East girls swimming received for winning the South Jersey Public Group A championship. Yoon is The Sun Newspapers Girls Swimmer of the Year after winning her third straight state championship in the 100-yard breaststroke. 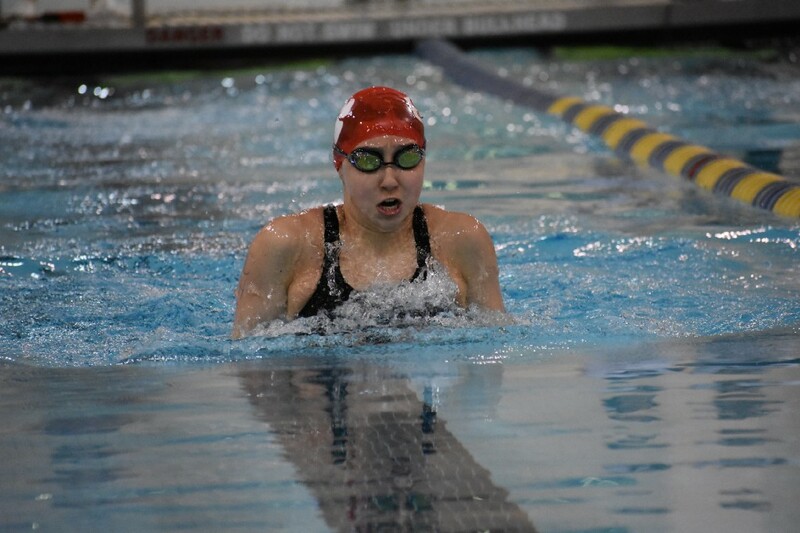 Cherry Hill High School East junior swimmer Grace Yoon won the 100-yard breaststroke state championship at the 2019 Meet of Champions on March 3. It was not a surprise to many in the swimming community to see Yoon take first after she had won the state title in the event in 2017 and 2018. However, Yoon admits she never expected to win the event three straight years. “I never expected that, no matter what season it is, because the circumstances always change and the competition will be different,” she said. Yoon’s humble and hard-working attitude continues to produce sterling results for Cherry Hill East. In addition to winning the state title in the breaststroke, Yoon helped Cherry Hill East’s 200-yard medley relay and 400-yard freestyle relay teams to second-place finishes at the Meet of Champions and was an important part of helping the Cougars reach the Public Group A state final. Yoon’s efforts make her The Sun Newspapers Girls Swimmer of the Year. 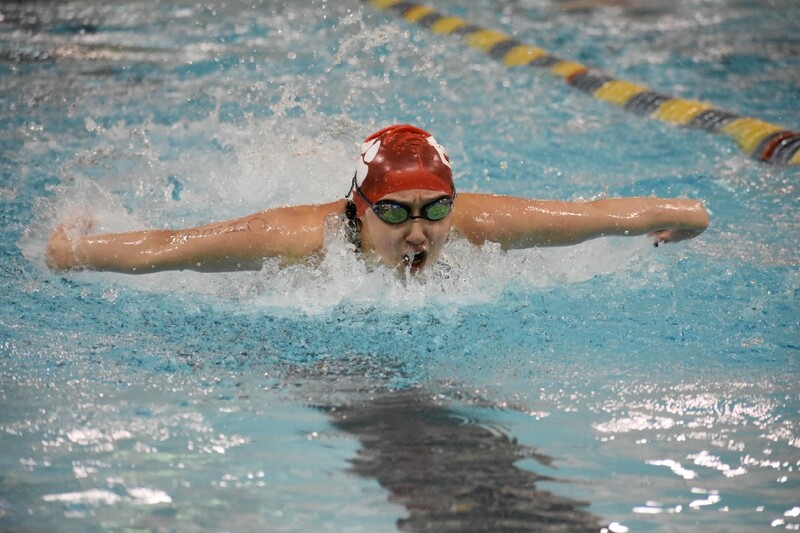 Yoon has been an impact swimmer since her freshman year for the Cougars. Some things have changed, such as Yoon’s development as a leader. Grace Yoon leads the pack in the 100-yard breaststroke during the NJSIAA Public Group A state championship against Bridgewater-Raritan High School. Cherry Hill East has won the South Jersey Public Group A championship every year since Yoon joined the program. This season, the Cougars went undefeated in the regular season, defeating Public Group B state champion Moorestown High School and Public Group C state champion Haddonfield Memorial High School. While Yoon’s best events are the breaststroke and individual medley, she annually puts up fast times in nearly every event. This season, Yoon swam in every event at least once except for the 100-yard backstroke. As exciting as it was to win the breaststroke at Meet of Champions, Yoon was even more excited to talk about the success both relay teams had at the meet. In the 200-yard medley relay, Yoon swam the breaststroke and helped the Cougars to a second-place finish with a time of 1:45.83. Then, in the 400-yard freestyle relay, Cherry Hill East put up a time of 3:30.35, coming up in second place just 0.35 seconds behind state champion Morristown High School. Grace Yoon dives toward the wall in the 100-yard butterfly during the NJSIAA Public Group A state championship against Bridgewater-Raritan High School. Bowser recognizes the talent Yoon has in the pool. She noted how Yoon had the stamina to race had a high level in three finals at Meet of Champions and said she is one of the few swimmers to come through Cherry Hill East whom other coaches are in awe of. Yoon is part of an outstanding junior class that includes other top-10 Meet of Champions finishers such as Brianna DiSanti and Karolyn Merch. The junior class has propelled Cherry Hill East to three straight sectional titles and two consecutive trips to the Public Group A state championship. A team state title is the only prize Yoon has yet to win in her high school career and it’s the one she will strive for the most in her final season in 2019–20.